Lupercalia (derived from lupus: wolf) was the name of a very ancient, pre Roman pastoral, held in the city of Rome, each year on February 15, to avert evil spirits and purify the city, releasing health, productivity and fertility. The Romans, associated many deities with the Lupercalia: Lupercus, Faunus, lnuus, Februus, and, but frequently than any other Roman god, Pan, or Pan Lycaeus (Pan Wolf). The festival was also known as Februa or Februatus and gave its name to the goddess Juno Februa(ta) and the month February. Alberta Mildred Franklin was a Professor of Latin and Greek. 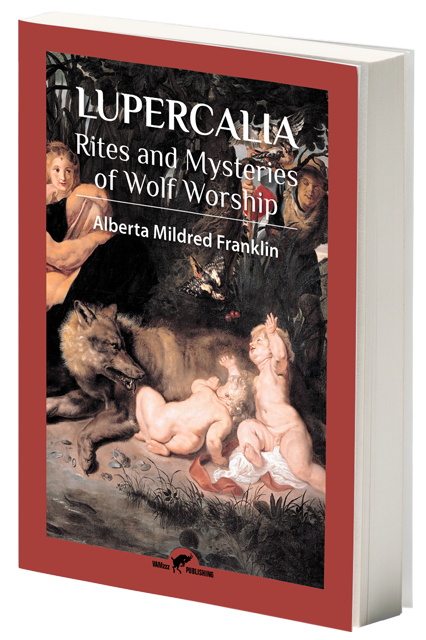 Lupercalia is the first substantial work on the case, the least known and still seen as one of the best. Apart from the wolf, her work also deals with two other Lupercalian ingredients: the goat and goat-god Pan and the dog. She compares the mystic and ritual role of these animals in both primitive Greece and Rome. The wolf-deity of the Greeks was Pelasgian, represented the devouring power of the underworld, and was worshipped by rites of expiation. The wolf-deities of Italy, among them Lupercus, were dreaded chthonic powers, and had several cults in the Mediterranean regions. The goat, representing fertility, was sacrificed to Lupercus. The dog-cults were mainly for purification, of Thracian origin, and the Romans borrowed them from the Greeks of Southern Italy and Sicily. Alberta Mildred Franklin was born December 10, 1880, at Farmingdale, New Jersey. She was graduated from Wellesley College with the degree of Bachelor of Arts in 1904. During her course she was made a Durant Scholar. She received the degree of Master of Arts from Columbia University in 1909. Read more about Alberta Mildred Franklin in the Post Scriptum of Lupercalia. The Eleusinian and Bacchic Mysteries focus on life, death and rebirth in a living nature (the present), while this nature was regarded as the converging of past and future. Taylor describes a series of lost secret rites. These rites were once the appointed means for regeneration through an inner union with the Divine Essence, despite their wild and sexual aspect.